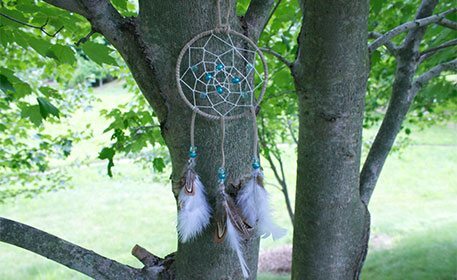 Make the nightmares disappear with a DIY dreamcatcher! Personalize it with your favorite colors to or match your room! Learn more about what dreamcatchers represent and why Native Americans created them below! Cut 20″ of 20g craft wire, form a circle and twist the ends together to close. Fold the circle in half, to create one smaller, thicker circle. Wrap tan suede lace around the two pieces of wire. Secure the end with hot glue. Tie one end of white friendship thread at the top of the dreamcatcher frame. 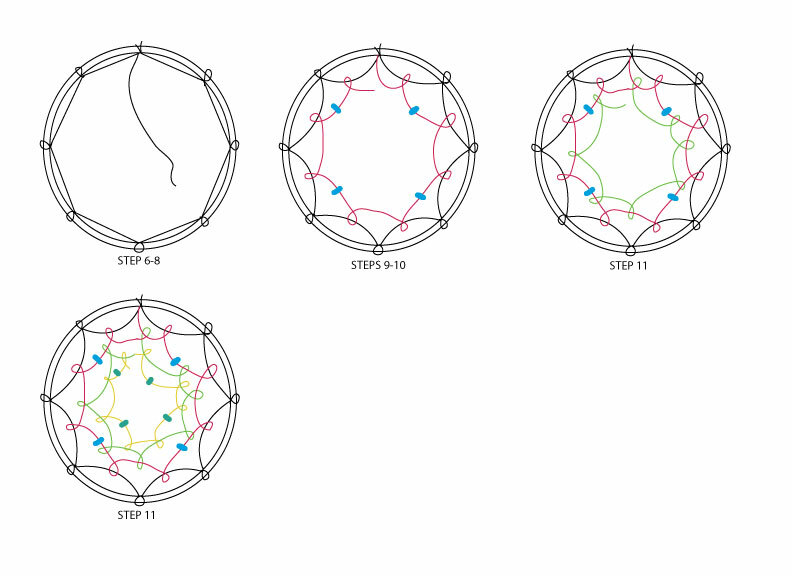 For Steps 6-11, download our free template for a diagram of how to weave the dreamcatcher. Loop the string around the edge, as shown. Pull the end of the string under and through the loop. Pull taught, not tight as the first row is loosely woven. The next hitch will be at the midpoint of the first loop in the first row. Before you create the next hitch, string on a translucent pony bead. For the rest of the second row, every other hitch should have a pony bead. The third row will have no beads. The fourth row you will add a dark pearl pony bead to every other hitch. Continue weaving until the hole is small enough and tie a knot. Cut off the excess friendship thread. Pair together 2-3 small brown feathers and 1 larger white feather. Wrap wire around the tops of all three to hold them together. Create three separate bunches of feathers. Cut two 3″ pieces and one 5″ piece of tan suede lace. Using hot glue, wrap the suede lace about a 1/2″ around the top of the feather bunches. String on 2-3 beads to the suede lace. Hot glue the feather bunches to the bottom of the dream catcher. The longest feather bunch should be in the middle. Attach a hanging loop to the top. Dreamcatchers were originally created by Native Americans to protect people from negative dreams and to let positive dreams slip through. The hole in the middle is where the positive dreams slip through and the rest of the web was believed to capture the negative dreams. For more information about dreamcatchers, visit this site!